Living a passionless, humdrum or uninspired life? Taking care of everyone else except yourself? Saying Yes when you mean No? Stuck in a relationship that doesn’t honor who you are? Dissatisfied with a meaningless job? Or living a life that doesn’t support your individuality? Exercises to guide you toward rapid change! Courage to integrate new choices and decisions to enrich your life! Ability to get beyond self doubt and creatively express yourself! The ability to go for what you want and express yourself in ALL situations! Daily positive practices which lead to honoring your authentic self! Express Yourself will help you summon the courage to boldly and authentically express who you are and give your best gifts to the world. Easy to read, yet organized and explicit. Express Yourself provides a synthesis of many aspects involved in the process of personal transformation. With it’s broad range of topics and extensive collection of effective exercises, it serves as a complete handbook for the individual dedicated to empowered life change. It makes a perfect Volume 1 to The 7 Keys to Connection, which then adds more understanding and practices from a greatly expanded perspective. In the reading of this single book you will come to enhanced understandings of such topics as: How to actively love yourself, transforming the inner critic, healing the inner child, moving emotional energy, developing a relationship of trust with self, boundaries and co-dependence, relationships and projections, learning to surrender, being in the unknown, and much more. You can accomplish what used to take years and the reading of many different books, if you follow the guidelines spelled out in this one powerful book. The 7 Keys to Connection then goes into greater depth of what is really going on inside your psyche to give you a greater understanding of who you are, and what has you operate the way you do – both the good and not so good. 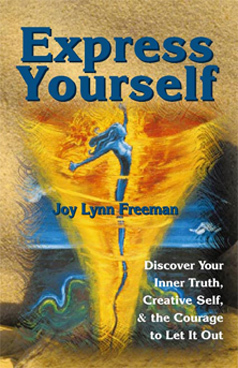 Express yourself comes to you as a Free PDF book or you can choose the Kindle version for 99 cents as well.